Universal Orlando Resort has added two event dates to Halloween Horror Nights 2018 due to popular demand – giving guests more chances to brave the most intense event in history, featuring more haunted houses than ever before. The added dates – Wednesday, September 19 and Wednesday, September 26 – make this year’s event the longest in history with a total of 36 nights. Universal also revealed details about the final haunted house that will be featured at Halloween Horror Nights 2018 – ScaryTales: Deadly Ever After. The twisted minds of Universal Orlando’s Entertainment team are bringing back a fan-favorite with a whole new twist in ScaryTales: Deadly Ever After. Guests will encounter The Wicked Witch of the West, who has seized control of the fairytale realm and is tormenting treasured storybook characters in hideous and cruel alternate storylines. As guests venture through this nightmarish bedtime story, they’ll see familiar characters now turned evil including Hansel and Gretel salivating for human flesh, a splattered Humpty Dumpty and more. For more information about ScaryTales: Deadly Ever After, check out the Universal Orlando Blog. Halloween Horror Nights 2018 will run for a record-breaking 36 select nights from September 14 to November 3 and feature the most haunted houses in event history. Cinematic greats, slasher films, cult classics and original nightmares inspired by the past will come to life as guests face 10 disturbingly real haunted houses, five sinister scare zones and more. See below for the full lineup of experiences at this year’s event. Due to the event’s popularity, tickets for this year’s highly-anticipated Halloween Horror Nights should be purchased in advance. For more information and to purchase tickets and packages, click here. Halloween Horror Nights takes you deep inside the twisted world of STRANGER THINGS. From a vile, secret lab to the terrifying Void to the monstrous reality of the Upside Down, you try to escape—but The Demogorgon is moving closer. Restless spirits have overrun the infamous house atop a cemetery, and they’re drawn to your light. You’ll be lured up into the house by the TV’s glowing whisper and cross into the light. Enter a surreal landscape, where your brief sense of wonder will soon shift to horror as you’re menaced by the Beast. Don’t get lost in the light. Evil has returned in an all-new house. The infamous Michael Myers has escaped, and he’s out for blood. Wherever you turn, he’s moving in for the kill, ‘til your heart is screaming out of your chest. Your only hope is Dr. Loomis, Myers’ fire-scarred former psychiatrist, but will he get there in time? This masked maniac is unstoppable, and there’s nowhere to hide. The haunted minds behind Happy Death Day and The First Purge have spawned another horror house. Your shock shifts to alarm as you go from a campy thriller to a brutal world. It’s the last day of the rest of your life as you witness a college student try to break a murderous cycle. Then enter the testing ground for a barbaric experiment, where all crime is legal for twelve hours. Will you live to see tomorrow? It’s Trick ‘r Treat time. In this maze you have play by the rules or pay the ultimate price. Your dread will grow as Sam, the vengeful trick-or-treater, waits for the moment he can treat rule-breakers to his favorite Halloween surprises: razor lollipops and sweet revenge. As you find your way through the five twisted stories of Trick ‘r Treat, you’ll recoil in terror when you witness the fate of those who didn’t honor the tradition. Don’t be caught dead breaking the rules. The world doesn’t get any darker. The planet has been infected with the ultimate pandemic. A ghoulish biological outbreak is turning swaths of humanity into a plague of vicious, swarming zombies. In a flash, you’re lost in darkness—but the zombies can still see you, and soon your growing unease will turn to screams and despair. If you’re not already afraid of the dark, you will be. The caramel-coated carnivals of yesteryear have long died, but something sinister has festered within the decay, waiting to torment trespassers. Enter a dilapidated salvage yard, a maze of rides, games and carnival parts tainted with rust and blood. Gleefully vicious performers stalk you from the shadows as your panic rises. You’ll be overwhelmed with disgust and terror as you encounter gory games a-plenty, brutal automatons that ensnare you and a grotesque tunnel of love. You’re in for a show-stopper. It’s showtime at the local drive-in, where you don’t just catch a movie; the movie catches you. Fear flickers on the screen, filling you with a mixture of dread and delight. As each 80s B movie screams to life, you’ll shriek with terror as you try to escape werewolf bikers, alien cannibals and a ravenous swamp yeti. When the credits roll, heads roll. Humanity is extinct, wiped out by a cataclysmic meteor. In its wake, something monstrous has taken root. You’ll be unnerved by familiar sights that have been overtaken by invasive vegetation. But soon your horror will ripen as you realize these plants are predatory, and you’re easy pickings. Fear is fertile in this gruesome garden. The realm of the fairies was once peaceful, but the Wicked Witch of the West has seized control and afflicted the land with a dreadful curse, twisting beloved fairytales beyond recognition. You’ll shudder as you discover the horrific new reality of the stories you thought you knew. There are no fairytale endings here. Chucky, the world’s deadliest doll, is back for more after 30 years of mayhem. Chucky has brought a toy fair to gruesome life on the streets of Hollywood and twisted your favorite childhood toys into nightmares. You’ll be dying to play. An interstellar circus tent has landed and a madcap invasion has begun on South Street. Step right up to the big top, where the sweet smell of cotton candy delights you. You soon realize this grotesque treat is not spun with sugar but from victims like you. Otherworldly clowns giggle madly as they zap people into cotton candy pods with ray guns and devour every grisly strand. At this circus of fear, the joke’s always on you. It’s December 31, 1984. As the ball drops in New York City, this New Year’s Eve bash is about to bite. Literally. A blood-sucking DJ counts down the biggest hits of the 80s as fanged punks, big-haired blood-suckers and lace-gloved vampires hunt down partygoers. The howl of synthesizers masks your growing screams. When this year ends, so will you. An ancient evil has been reawakened in Central Park and transformed Halloween into an abomination. Vines coil like vipers around iron fences. Rotting pumpkins molder upon the cursed ground. You’re horrified to discover the larger ones hold human victims whose decayed flesh has mingled with pumpkin guts. You cringe in horror, but the worst is yet to come. Beings of blood and vine seek out human sacrifices. And you’re ripe for the taking. An old barn is the setting of every kind of horror, its walls decorated with objects from each house. Pose at this foreboding photo op along the Avenue of the Stars, but be wary. This barn is not as abandoned as it seems. Foul creatures lurk between the hay bales, ready for a harvest of flesh. Will you survive the reaping? With a wicked mix of dance, acrobatics and theatrics, Academy of Villains is back with an all-new performance. Prepare for maximum overload in this test of humanity versus technology. Set in a dark and distant city of the future, Academy of Villains hack into a world of pounding synths and neon lights. This year, “Halloween Horror Nights” brings a taste of Hawkins, Indiana to Universal Studios Hollywood and Universal Orlando Resort inviting guests to enjoy foods inspired by Netflix’s “Stranger Things” that also complement the terrifying “Stranger Things” mazes debuting at both parks. “Halloween Horror Nights” begins on Friday, September 14, 2018. The specialized foods were created by the executive chef and culinary teams at each park to further enhance the already immersive “Halloween Horror Nights” experience. Benny’s Burgers: This classic, aptly named after the show’s family-owned diner, features a juicy beef burger served on a potato roll and a side of Tater Tots®. The Upside Down Burger: served “upside down,” this signature burger features spicy queso and Flamin’ Hot® Cheetos® served on a potato roll with lettuce, tomatoes, and a side of Tater Tots. Benny’s Chicken & Waffle Sandwich: Drizzled with sage-maple aioli and topped with sweet and sour onions, lettuce and tomatoes, this grilled chicken sandwich is served on iconic Kellogg’s® Eggo® waffles with a side of Tater Tots. Demogorgon’s Totcho: A twist on the classic nacho, this dangerously delicious snack piles up Tater Tots, doused in spicy queso, chili, Flamin’ Hot Cheetos, sour cream and scallions. Eleven’s Waffle Extravaganza: Inspired by the lead protagonist’s favorite food, this tasty treat mixes Reese’s Pieces, jelly beans, chocolate chips and whipped cream stacked high on three Kellogg’s Eggo waffles. Additional treats will be served throughout the theme park including Mini Meatball Subs, Loaded Mac ‘n’ Cheese, and Stir Fry Noodles as well as Voodoo Doughnuts. Universal Orlando’s “Halloween Horror Nights” will also feature additional highly-themed food and beverages inspired by this year’s ‘80s theme and Halloween overall, including a unique Candy Corn frozen drink, a sweet and sour drink called “Gnarly Twist,” a special HHN Tombstone Doughnut at Voodoo Doughnut, and more. For a complete list of the highly-themed food and drinks available at Universal Orlando’s “Halloween Horror Nights,” click here. For the first time ever, Universal Studios Hollywood, Universal Orlando Resort and Universal Studios Singapore are partnering with Netflix to bring “Stranger Things” to life at this year’s “Halloween Horror Nights” events. Fans of the series will get the chance to brave the Upside Down and confront the supernatural as each park debuts all-new mazes inspired by season one of the critically-acclaimed series. For more information and to purchase tickets to “Halloween Horror Nights” at Universal Studios Hollywood, Universal Orlando Resort or Universal Studios Singapore, visit http://www.halloweenhorrornights.com/. Please enjoy “The Pitch” – a sketch starring A SIMPLE FAVOR stars Anna Kendrick and Blake Lively along with the film’s director Paul Feig. Watch the trio pitch A SIMPLE FAVOR to two clueless Hollywood executives played by Thomas Lennon and Annaleigh Ashford (Broadway’s Wicked and Legally Blonde). It’s a comedic take on the absurdity of trying to get a movie made these days, especially for women and a director known for working with women. SYNOPSIS: A Simple Favor, a stylish post-modern suburban noir directed by Paul Feig, centers around Stephanie Smothers (Anna Kendrick), a mommy vlogger who seeks to uncover the truth behind her best friend Emily Nelson’s (Blake Lively) sudden disappearance from their small town. Stephanie is joined by Emily’s husband Sean (Henry Golding) in this stylish thriller filled with twists and betrayals, secrets and revelations, love and loyalty, murder and revenge. A SIMPLE FAVOR opens in theaters this Friday, September 14th. 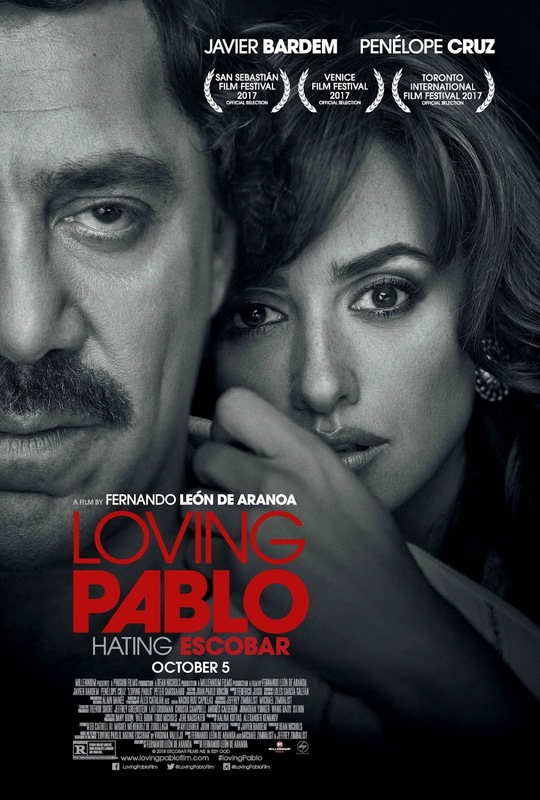 “Loving Pablo” chronicles the rise and fall of the world’s most feared drug lord Pablo Escobar (Academy Award© winner Javier Bardem) and his volatile love affair with Colombia’s most famous journalist Virginia Vallejo (Academy Award© winner Penélope Cruz) throughout a reign of terror that tore a country apart.